Project obstacles and solutions: LP Field is the home of the NFL Tennessee Titans. The stadium authority put out bids for 12 high speed elevators. PBG Builders were awarded the contract and Charter Construction was the subcontractor responsible for the construction of the concrete shafts. The shaft specs called for 12 wall sections, each 16 feet tall, to be constructed around each elevator mechanism. The concrete for the job had to be self consolidating so that vibration tools were not needed. This was critical for both strength and for the construction schedule to make sure the job was completed on time. It was also crucial that the concrete did not need to be rubbed once the forms were removed. Since the exterior of the shaft was a finished product, the end product required a smooth finish. Charter Construction poured a test wall with another concrete supplier, but found that their concrete did not meet the job requirements. The project was at a critical juncture and Charter needed a new concrete supplier. Charter contacted the IMI Nashville regional office and asked if they had supplied concrete for a job with similar specs. Doug Poe from IMI Tennessee suggested they take a look at VA Hospital expansion located at Vanderbilt University. IMI had used imix 180, a self-consolidating concrete for the sheer walls of the VA project. Using imix 180 would meet the job requirements, since it is a high slump concrete and needs no vibration to pour it into place. It also does not mirror the texture of the forms and provides a smooth finish that does not need rubbing. But the added value was that imix 180 achieves early strengths of 2,000 psi in 16 hours, 3,000 psi in 24 hours. This allows forms to be taken down and reset earlier than would be possible with other concrete walls. Charter visited the hospital site and asked IMI to supply imix 180 for a test wall the next morning. After Charter and PBG engineers approved the test wall, IMI was asked to take over the project and began pouring that afternoon. 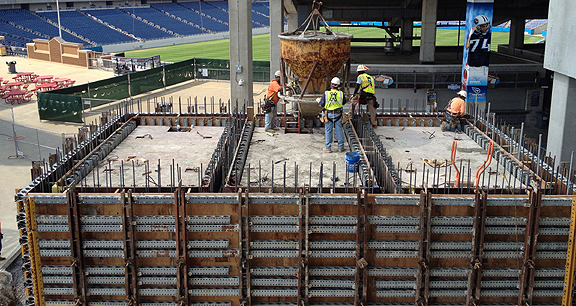 IMI supplied a total of 918 yards of imix 180 for the LP Field elevator shafts. The speed at which it can be poured and the ease of placement helped get this project back on schedule. In fact, the shafts were completed three days ahead of schedule. This project won the Tennessee Concrete Association's Best Specialty Concrete Project Award for 2012. For more information on imix 180 for concrete walls, click here.